Government regulation has forced the manufacturers of tobacco products to post warnings in conspicuous locations on their packages. However, not everyone who smokes is aware of the significant dangers that the habit poses to their oral health. 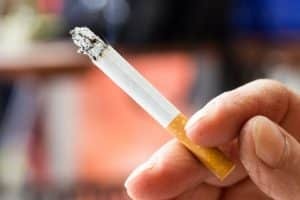 To raise awareness of the dangers of smoking, we explore some of the more troublesome facts about how smoking and smokeless tobacco can seriously threaten your oral health. Smoking can lead to immediately obvious oral health issues, including bad breath (halitosis) and tooth discoloration. It can also inflame the salivary gland openings at the roof of your mouth, leading to or exacerbating dry mouth (xerostomia). Smoking interferes with the normal functions of your gum tissue cells, leading to an increased risk of developing periodontal disease. This interference also impairs blood flow to the gums, which impairs wound healing. This can lead to complications following dental procedures, such as tooth extraction, periodontal disease treatment, root canal treatment, or oral surgery. Smoking also lowers your chances of a successful dental implant procedure if you wish to replace one or more missing teeth. Aside from the impaired healing process, smoking also increases alveolar bone loss (deterioration in the jawbone region that anchors teeth and is needed to support a dental implant). Smokeless tobacco is equally as harmful as smoking tobacco. Smokeless tobacco products contain at least 28 chemicals that are known to increase the risk of throat, esophageal, and oral cancer. One can of snuff (a form of smokeless tobacco) contains more nicotine than over 60 cigarettes. Tobacco can irritate your gums, causing them to recede from your teeth and expose your teeth’s roots. Exposed roots are a common source of tooth sensitivity and can lead to tooth decay, as well as periodontal disease and possibly tooth loss. If you would like to quit smoking, ask us about smoking cessation and how we can help you give up the habit. To discuss your options, or to learn more about improving your oral and overall health, schedule a consultation with Dr. Kania by calling her periodontal office in Encinitas/San Diego, CA, at (760) 642-0711.